Our roof was “loaded” (i.e. 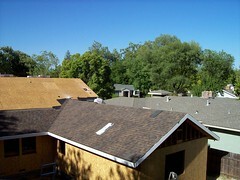 the material was delivered and distributed around the roof) on Tuesday. 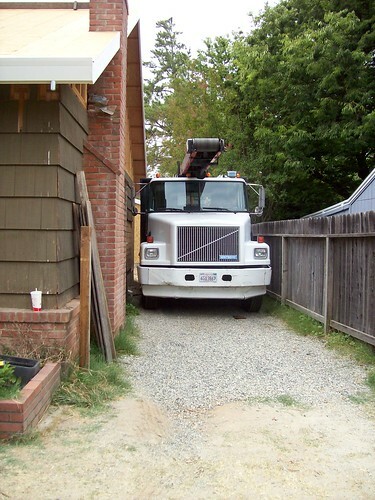 The truck just *barely* fit down the backyard driveway. 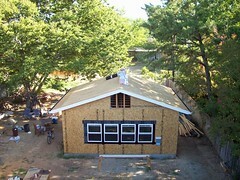 They hadn’t started on Barb’s quilt shop yet, but that’s an extremely simple roof–no penetrations, valleys or hips, just a simple gable roof with an easy 4/12 pitch. 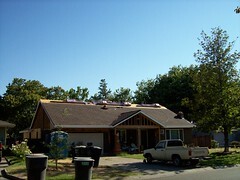 Bill expects to finish the roof on Friday if it doesn’t get too hot; otherwise, they’ll knock out the remainder on Monday morning. 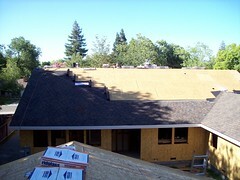 This entry was posted in Our home remodeling project, Uncategorized and tagged roof. Bookmark the permalink.